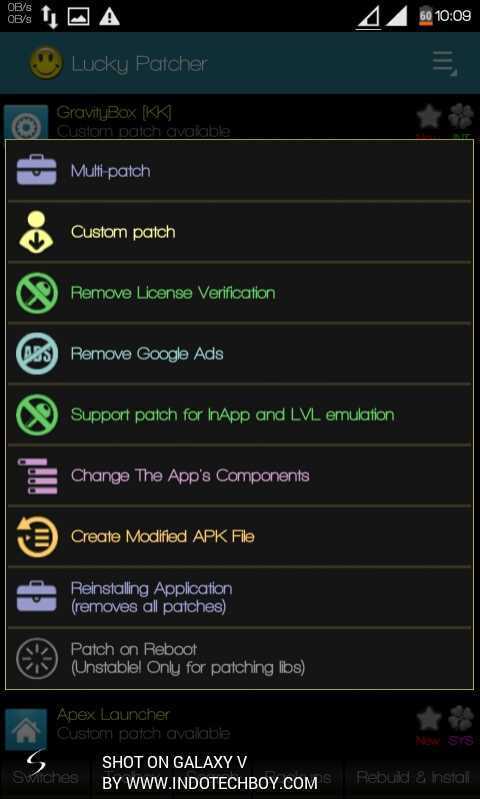 Lucky Patcher (APK) is an all-in-one root-needed Android app with numerous tools packed in one app. Although the most popular and most-seek feature by people from Lucky Patcher is indeed the in-app purchase hack, a hack into an Android app/game to get in-app purchase items for free. Long long ago, Lucky Patcher (APK) Android app was shared through Android communities like XDA forum. But maybe because there are many groups who dislike Lucky Patcher existencies (especially Android application and game developers, LoL :D ), Lucky Patcher now only exist and can passed to Android enthusiast through small/regional communities and personal websites (like my Blog). Android app in-app purchase hack (we can get items like premium features, money, game currencies for free, WOW!). Remove annoying ads in Android applications. Remove Google license verification from an Android app, so the paid applications can be installed for free on our Android device with passing the verification process. A little bit of knowledge about Android system will be very useful when using Lucky Patcher. There are many functions and tools packed in Lucky Patcher Android app. If you understand or familiar with Android hacking and modding, you will understand by yourself all of the tools includen in Lucky Patcher. So at this post, I will only summarize about how to use or activate popular Lucky Patcher features. The most popular amongst popular features of Lucky Patcher, the in-app purchase hack. Get in-app purchases in Android application like premium features, game currency like gold, remove ads, etc! Tick the "Google billing emulation" so the switch turned green. Blocking the bloating ads in Android applications can easily be done using Lucky Patcher. Tap "Toolbox" -> "block ads" -> "block ads on device". If you experience some errors on Google apps like Play Store, Play Game, etc. Go to Lucky patcher "Toolbox" menu -> "block ads" -> "clear the local host file". Tick the "Google license verification emulation". Open Lucky Patcher app. First you may want to tap on "Switches" on the bottom, then tap the "Set switches to default". We do this because sometimes Lucky Patcher patch switches become messed up to how it should not to be. Look for the Android application you want to patch and tap it. Choose what you want to be hacked for the Android application, is it the in-app purchase, license verification, removing Google ads, etc. -> Apply the patch. Now open the app to test it :) . If you have Xposed Installed, it even could be easier to apply Lucky Patcher to every installed Android applications on your device. Just activate the "Lucky Patcher patch plus" module in Xposed setting then open Lucky Patcher app, tap the top bar menu -> "Xposed setting" -> Choose what patch you want to apply. By this, you don't need to patch every Android application manually anymore. Besides the well known functions of Lucky Patcher Android app mentioned above, Lucky Patcher also has some of extended function included in its menu called "Toolbox". Block Ads: Turn of Google Ads service, Block Ads on device, Unblock Ads on device, Clear the local 'hosts' file. Patch to Android: Set signature verification to always true, Disable .apk signature verification, Disable signature verification in the package manager. Install modded Google Play Store. Clear Dalvik Cache and reboot. Select default install location on Android Kitkat and older. Major update. Many new features and translations added. - Chelpus, The developer of Lucky Patcher Android application. Comments (1) in "Lucky Patcher APK Android Application Download + Tutorial"
Wow, I hope you are the real Chelpus . But still, I want to be careful because internet is a dangerous place, there are many scammers out there. I always test the app by myself (especially ROOT app) before make a post about it.